No one can deny that these are interesting times, not only in South Africa, but in the world as well. The word "interesting" can be dissected in various ways, and one of them leads straight to politics and the effect it has on the economy which eventually circles back to the stock market. The stock market is after all a barometer of the underlying health of the economy, but far too many articles have been written on this topic. Instead I would like to address a question that seems more relevant to long term investors - is it a good idea to try and time the market? As with everything in life, before being able to answer a question about the future, the appropriate starting point is to understand where we’re coming from, and the only way to do this is by digging into the history books. Below is a 90-year log chart of the S&P500 - an index that contains 500 of the largest US companies. During the great depression of 1929-1932, the market crashed and fell more than 85%. For the next five years, stocks staged a big comeback, returning 42% annually. In 1937, stocks once again crashed 55% after the US GDP contracted more than 18%. 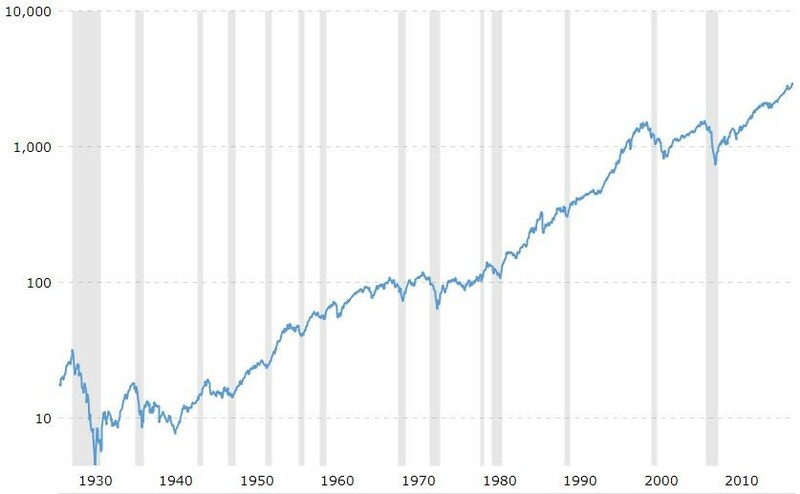 After the rollercoaster ride of 1929-1937 and for the next couple of decades, the market grew tremendously and didn’t really crash again until the early 1970s, after which it mostly moved sideways. After this crash, the S&P500 continued its climb from 100 to 1000 over the next couple of decades, only to be stymied by the Asian crisis in 1997, the dot-com bubble of 2000 and the most recent 2008 financial crisis. Depending on who you ask, certain people will say that it’s all random and that there’s no clear trend. Other might disagree and point to an underlining trend. I tend to agree with the latter, the obvious trend - upwards. Despite numerous investment professionals’ calls over the last couple of years, the market hasn’t crashed. In fact, it has developed into one of the biggest bull markets in history - after all, records are there to be broken. There are numerous valuation metrics that can be used to suit either narrative, namely an impending crash vs a continuing bull run. The moral of the story is that the US economy (the bellwether of the world economy) keeps on rolling with the punches. Over the last couple of years, we’ve seen consistent GDP growth, with Q2 being a blockbuster quarter. There’s no doubt that current market valuations are a bit “lofty” and that it has been fuelled by debt via the Fed and its QE program. 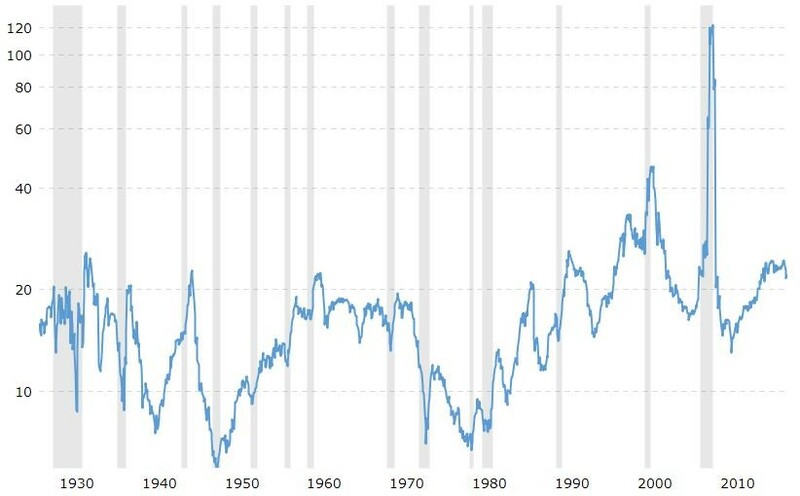 The historical price to earnings ratio (P/E) is at a higher-than-normal level (see graph below) and yes, there are definitely warning signs, but there have been warning signs for the last 9 years. Despite this, the market continues its upward trajectory. If earnings come through and inflation stays steady, this should continue to be the case (at least for the short term). The simple answer is no, it will not. History shows us that drawdowns and crashes are part and parcel of the long-term upward trajectory. 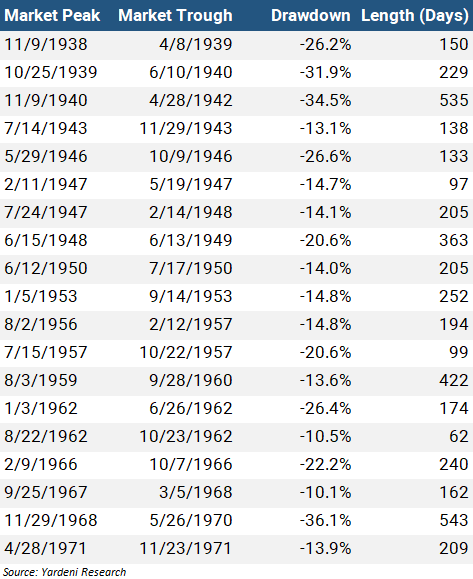 Below are two tables highlighting the drawdowns experienced between 1938-1971 and 1974-1999. 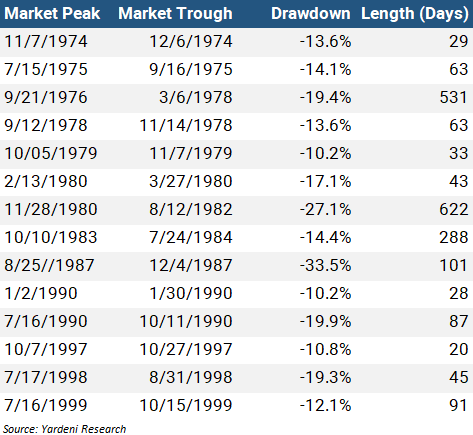 When looking at these and comparing the long-term S&P500 chart, these drawdowns look minute. This brings me to my big question: Is trying to time the stock market worth it? Although it is entirely possible that the next downturn could be the next big crash (most people are already assuming this), history shows that it is also possible that it may just be another drawdown. There is simply too much data processing and emotional burdens that need to be overcome for investors to accurately time the market. I’m not saying it can’t be done, but if you’re not one of the very few investors that regularly feature in investment books, my suggestion is to focus on the things that can be controlled (costs, asset allocation, with whom you invest etc.) and to stop worrying about the things you can’t (the stock market). Steinman joined Sharenet in 2018 as a director of the Sharenet Johannesburg branch. Prior to this, he was a director at Capilis Asset Managers, an asset management company he co-founded in 2015. Steinman holds a B.Eng (Industrial Engineering) degree from the University of Pretoria which he obtained in 2010 and is a registered CFA� charter holder. Steinman has more than 5 years’ experience in the investment management industry.